Julia Mancuso -- the most decorated U.S. female alpine skier in Olympic history -- expects to come back to the World Cup in mid-January. CHERRY CREEK, Colorado -- It has been a year since hip surgery sidelined Julia Mancuso from skiing for the first time in her decorated career. On the November day I meet with her for lunch, the 32-year-old has been building her way back to the start gate but is taking a couple of days off. She's meeting her mom in Denver and just finished a gym session with her personal physiotherapist. After finishing a meal of fish tacos and carrot ginger juice, the Olympic champion gets up from the table and is noticeably limping. "Yeah, I have a little swagger," she says cheerfully. "I'm still working on extension stuff." In a few hours, the four-time Olympic medalist will meet her fiancé at the airport -- Dylan Fish, a manager at a resort in Fiji where the couple met two winters ago, just when Mancuso was beginning to believe that true love "would never happen." She had gone to Fiji with some friends for her 30th birthday and met Fish. They spent every evening of the trip talking the night away, but when it came to making the first move, "it was like high school," as neither took the leap at first. Then Mancuso extended her stay. "We started talking, and the conversation was never-ending," she says. "It was one of those." The first wedding is scheduled at the end of December at Mancuso's home resort -- Squaw Valley, California. A second celebration is planned for Fiji in April. Mancuso hopes to bring Fish to Europe after she begins her World Cup comeback in mid-January in Zauchensee, Austria. Julia Mancuso (left) with her physiotherapist, Martina Wegscheider. Born with hip dysplasia, Mancuso has suffered with right hip pain for the majority of her career, which spans 16 years of competing in the World Cup. The pain became crippling at the end of the 2015 season, and she opted for surgery last November. The procedure, which involved extracting loose pieces of cartilage and stabilizing the joint, forced Mancuso to spend three months on crutches and to trade water therapy for her typical off-the-hill activities like surfing and inline skating. She made her way back to snow last spring and started training in the gates this fall. She is still undergoing stem cell treatment in an effort to restore cartilage. She has focused most of her training on body-weight-strengthening exercises and Pilates. "I'm a firm believer in full-body connection, building the neural pathways together," she says. "I wasn't going to go crazy on my arms because I couldn't lift my legs. I believe when you have a healthy body, it will gain strength as one." Mancuso spends most of her gym time on low-impact Pilates equipment such as the Reformer and CoreAlign. Her biggest strength goal: A low, one-legged squat. "I've been doing body-weight squats, holding for three to five minutes ... really burning the quad muscles. That's been my way to get strong. Otherwise, the biggest plan is to do as much on snow as possible." The snow is, of course, where Mancuso can always find herself. "It's amazing how my body performs when I'm out doing what I know and love," she says. "The adrenaline kicks in. Some people with injuries are really good in the gym, then they get out to ski and they're like, 'ouch.' I'm the opposite. I'm not great in the gym, then I get out on my skis and I feel free." Mancuso says she "never really felt sad" about her predicament and has dedicated a lot of energy to the mental component of her recovery. "I keep positive when things aren't positive," she says. "Every time I want to cry because things aren't working, I take a step back and say, 'This is ski racing. It's fun. Deep breath in.' It's not emotional. I don't want to hold emotion in my body. I want my body to be a machine." Naturally, the machine needs fuel. During her recovery, Mancuso has focused on consuming more protein and less carbs and sugar. She has also become certified in health coaching, so she can impart her wisdom and philosophy to others, expanding her business -- Pure Golden Wellness -- in online health consultations. "What I feel I can give back to the world is to practice mindfulness," she says. "At the end of the day, if I really need something, if my energy is turning negative, I put in the extra effort. Your mental game is as important as anything else. When you need to draw upon something then and there, expecting to be at your best, you have to build on those skills." In a two-minute downhill race, there is not a lot of time to draw upon one's cerebral toolbox, which is why Mancuso prepares with meditation, positive self-talk and visualization. When she doubts herself in training or competition, she'll often say to herself, "What's that feeling I'm searching for? What does winning mean?" It changes the focus of her thoughts, and her performances have shown that mental strength. 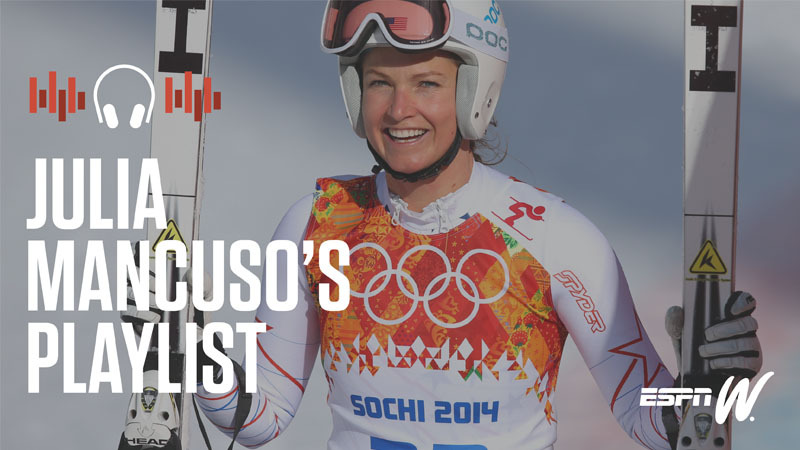 Mancuso's medal-winning runs have sometimes been described as "miraculous," because they are often unprecedented, taking place when months or even years have passed since she's landed on a podium. Hence the nickname "Super Jules." "I have magical powers," she says. But when it comes down to it, the powers are carefully developed. Her most recent Olympic medal in Sochi came at a time when major equipment issues were taking a serious toll on her hip. But she ramped up her mental game to overcome the physical setbacks. "I spent an hour every day envisioning myself winning, understanding how it feels and putting that energy out into the universe," she says. "I believe in positive energy and putting that purpose and intent out there. The power of intention is so important." Mancuso's intention now is to put her powers back to work toward another Olympic medal. She guesses that the 2018 Winter Games in PyeongChang will serve as the grand finale of her racing career. The mental picture is already in motion. "I'm visualizing my body being as healthy as possible, visualizing my joint being good. I'm visualizing myself winning races. I'm being grateful for this opportunity and for my life. If I wake up and think of things I'm super grateful for, it puts me in a better mood. And I'm a lot more productive when I'm in a better mood."